Toad in the hole is one of those British oddities that no one outside of the UK seems to have ever come across… The dish consists of sausages snuggled in an oven-baked pancake batter drizzled with gravy. It is not the most photogenic or elegant dish, but many would say that toad in the hole is a staple of British childhood. Most Luxembourgers would say the same about sausages (remember the Rëndelchen at the butcher’s? ), and Wäinzoossis, a sausage made with wine and traditionally served with a creamy mustard sauce is a dish we hold very dear. I decided it was time for these dishes to get acquainted and they seem to have hit it off: this Luxembourg/British hybrid totally rocks! You can watch me make this Toad in the Hole in my show. Start by preparing the batter: beat the eggs and mustard together in a large bowl. Add the flour and beat into a smooth batter, gradually adding the milk and the beer. Season with the salt and some pepper. Set the batter aside to rest for 15 minutes. Meanwhile, put 4 tablespoons of sunflower oil into a non-stick roasting tin. Place the sausages into the oil. Bake in the preheated oven for 10 minutes, turning them halfway through. Once the sausages have baked for 10 minutes, take out the roasting tin, quickly pour in all the batter and put the tin back into the oven. Leave to bake for 25 minutes without opening the oven door. While the toad in the hole is baking, prepare the mustard sauce. Peel and finely chop the shallot. Melt the butter in a saucepan and fry the shallot for 4 minutes until soft. Add the white wine and cook for 3 minutes. Mix the cream with the mustard and add to the saucepan, simmer for another 3 minutes. Season with salt and pepper. 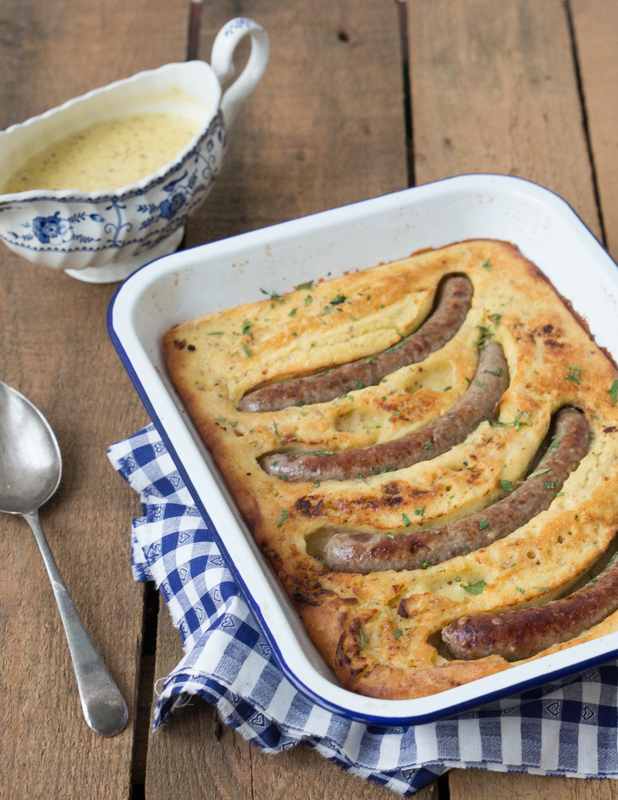 Serve the toad in the hole straight out of the oven and drizzle with some mustard sauce.